We Help You See all the Sights of Las Vegas! You need great vision to experience and enjoy all the sites and attractions of Las Vegas, NV! 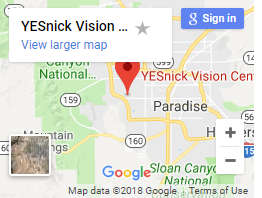 Before you explore our fantastic city, be sure to pop in at YESnick Vision Center. 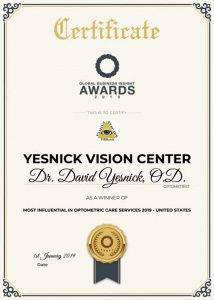 Our friendly, expert eye doctor, Dr. David Yesnick, will satisfy all of your eye care needs. In a city famed for extraordinary resorts, entertainment, nightlife, dining, shopping and gambling, our optometry practice offers you warm and personalized service in Las Vegas. Already half a century old, the icon of Las Vegas – known as the Gambling Capital of the World – is Caesars Palace, where you can hit the poker room, baccarat pit, or commit yourself to the table games. For slots, the Palms is a favored casino, where payouts are reputed to be higher than usual. If you specialize in poker, the high-end Bellagio is where you want to go. With architecture inspired by Italian extravagance, a 36-story tower soars above an artificial 8-acre lake with dancing fountains at this casino resort. When you tire of gambling, people-watching is another popular activity in Las Vegas! For a completely different environment while dining in Las Vegas, reserve a table at the Wynn Lake of Dreams. This resort is hidden within a small hill covered in lush greenery, yet that’s the only understated part of the design. Once you enter, you’ll be awed by the 150-ft mountain and 40-ft waterfall. Another amazing place to sip your cocktail with dinner is at Parasol Down, where the adjacent lake explodes with color from over 4000 lights, holographic pictures, and musical accompaniment. If you take Las Vegas Boulevard all the way north until Sahara Avenue, you’ll reach the Stratosphere. Billed as the tallest building in Nevada state, four extreme rides wait to thrill you at the top: SkyJump, Big Shot, Insanity: the Ride, and X-Scream. After you finish shrieking with exhilaration from these amusement rides, it may be time to engage in some of the calmer Las Vegas activities. Head northwest to Rancho Drive and the historic Las Vegas Springs Preserve. There you can stroll on tranquil trails and gaze at the beauty of nature. Rock climbers will appreciate Red Rock Canyon National Conservation Area, which features wondrous red rocks perfect for hiking. Even farther away from the Las Vegas Strip (about 30 miles) is Mt. Charleston, where cool air blows across the many hiking trails. Like every great city in the United States, Las Vegas features many worthwhile museums. The Neon Museum offers a one-of-a-kind display of historical and creative 20th century signs from this lively city. We also recommend that you check out the Mob Museum, which shares the timeline of the mafia’s hand in developing Las Vegas. The Pinball Hall of Fame is another odd delight, where you can play over 150 pinball machines. The most offbeat museum is probably the Atomic Testing Museum, which puts the Nevada Test Site for nuclear weapons on public display. At YESnick Vision Center, we love the vibrant energy, diversity and quirks of Las Vegas. We encourage you to come see this fantastic city for yourself! Las Vegas has tons of family-friendly things to do. Some of the best places you can visit with your family are right here in Las Vegas. If you lost your glasses while in Las Vegas or got something stuck in your eye, scratched your eye, or have an eye infection? Don’t sweat it, our awesome team will have you back to enjoying your holiday in no time. YESnick vision is the largest private family optometry practice in Las Vegas. Getting to Yesnick vision Center from the hotels on Las Vegas Strip If you have never been to Las Vegas, then its okay if you assumed you could take a breeze walk from one end of the strip to the other. Not that you can’t do it, but we would not recommend it unless you want to spend a whole day nursing blistered toes.